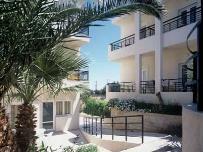 The Cosmopolit apartments are located at the top of the Beach Road in the popular resort of Malia in Crete, close to the lively nightlife area of the resort. The old village with its traditional Greek restaurants serving a range of local cuisine is less than 15 minutes from the Cosmopolit apartments. Malia is a bustling resort with excellent amenities and plenty of daytime and evening attractions; so book your active holiday to Malia today. ? These 3 star Crete self catering apartments are 15 miles from Heraklion airport, ideal for those of you who just cant wait to get involved in all the action as it should only take 30 minutes to transfer to Malia. Cosmopolit Apartments has 44 apartments split between 4 blocks, all with air conditioning and a kitchen for all your self-catering needs. Other facilities at the complex include a large swimming pool and spacious terrace area where you can kick back and work on your tan, Internet access,games room, TV room with satellite TV, billiards.